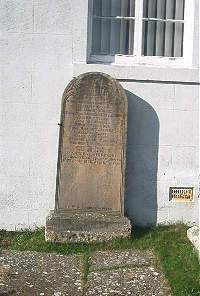 Erected by William Sinclair in memory of his parents. John Sinclair died at Reisgill 20th Febuary 1879 aged 84. Wife Margaret Bruce died at Reisgill 24th Febuary 1888 aged 89. Son John Sinclair died 16th January 1860 aged 26. Wife Mariery Sinclair died at Glan Cottage Blantyre 9th August 1900 aged 65.